Riding atop the same bones that give strength to the Impreza, the 2014 Subaru XV Crosstrek elevates the brand by creating a compact 5-passenger SUV with all the ground clearance and off-road ability of the larger Outback, but for a lot less money. This year, a hybrid variant is offered delivering even better fuel economy and more power. This is my review of my own personal 2014 Subaru crosstrek. My Subaru Crosstrek is a very good vehicle. It is very reliable. It is small enough so it is easy to get around in traffic and parking lots, yet is quite comfortable inside and feels fairly roomy for the size. It sits higher off the ground than the Impreza, which is why I chose the Crosstrek over the Impreza. 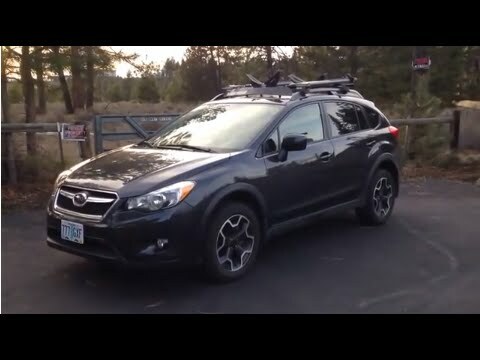 It is a sporty looking car, nice and unique looking vs other similar cars on the road, and people seem to love the black wheels that are standard on the Crosstrek. Of course, being an all wheel drive Subaru, you have one of the best all weather vehicles on the road, with good safety ratings and reliable performance in inclement weather. The only drawback I have seen with the vehicle is the lack of power with the engine. Do not get me wrong, it drives highway speed very well and moves around good enough in getting in/out of traffic, but as far as jack rabbit start power or acceleration of any type, it is not as powerful as I have had in other Subaru's. Now, of course it is not a sport vehicle or a race car, so I accept the car for what it is, which to me is a very reliable and comfortable, fun vehicle that I will be able to count on for many years into the future. Alaskan hybrid: handling whatever life throws your way. When looking for my �adult� car I wanted the car to be reliable, comfortable and have something unique about it. I fell in love with the Subaru crosstrek hybrid in the plasma green finish. The hybrid feature allows the car to run on gas and/or battery, saving money in the long run. The car handles the snow with class. Living in Alaska where snow levels are unpredictable, the Subaru was able to get me to and from work no problems, with little to no skidding around icy corners. Hills are no problems either. One of the best features that was a must have included the heated front seats for the freezing Alaska winters. They will even start up when using the remote start! The only problem I have had so far, is the factory battery the car comes with does not last long. You will need to upgrade to a new stronger battery. As the battery level lowers, the hybrid features start detecting faults through the car, which are both true and false readings. Once you replace with a new battery all these readings return to normal. Fun all-wheel drive crossover that will really take you places! This is the first vehicle I have owned as opposed to leased and I do not regret my choice. Subaru has been a trusted name for years and after 4 years of owning my car, I still love it. I find it to be comfortable and can easily accommodate 4-5 passengers. There is not a ton of cargo space in the back so if you have a lot of passengers with luggage, you may want a carrier on the roof. But if you need to haul things around, you can easily lay down seats and pack things in. I made a cross-country move in this vehicle and it was jammed with personal items. The only repeating issue I have had so far is with the Bluetooth connectivity. I can connect with my phone (Apple iPhone 8 plus), but it may not always maintain connection and it is unclear why. After it does lose connection, it seems to take a while for the car to release there is no device connected before I can reconnect. 2014 Subaru Crosstrek Review from an Owner!! !